Learning how to display jewelry is more than just about appearances. You need to consider how your display will function within the selling space and how it will serve your customers. Ultimately it is about how to sell jewelry. The better your display and the more you take care in the planning, the more it will translate into sales. With a few items from the art store, the dollar store and the fabric store you can make a unique display that makes your jewelry look like candy in a candy store. Let's get started on how to display jewelry with a few jewelry display ideas that are both store bought and DIY. 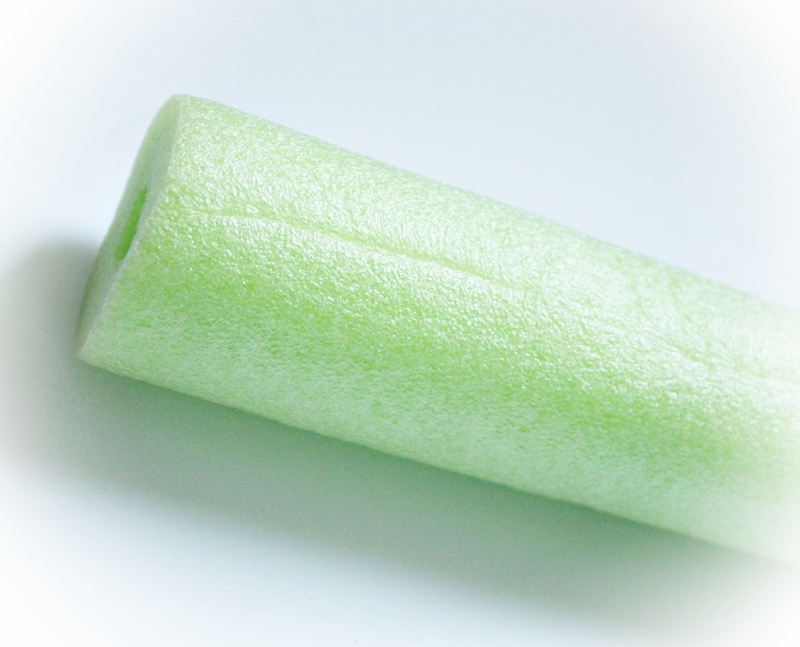 ONE - The Pool Noodle - You can pick up a pool noodle at most dollar stores, bargain stores and big box stores as soon as all the swimming paraphernalia comes out in the spring. You can chop up this foamy noodle with a bread knife and cover it with the fabric of your choice for an instant bracelet display. Slicing a little off the bottom will create a flat sitting surface and will remove enough bulk so that you can easily fit bracelets around it. Because of the softness you can also use u-pins to secure your bracelets. If your line is heavy on the bracelets then you could consider lining up several of them to fit in a tray and they can be whatever length you want. 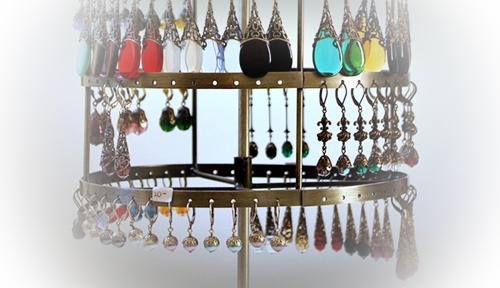 TWO - Revolving Racks - The revolving rack is a great phenomenon in the jewelry business. Not only do they maximize space, but they are a real attraction factor with customers. People love the contact with the display and being in charge of their own discovery. They are a great interactive feature for your display. 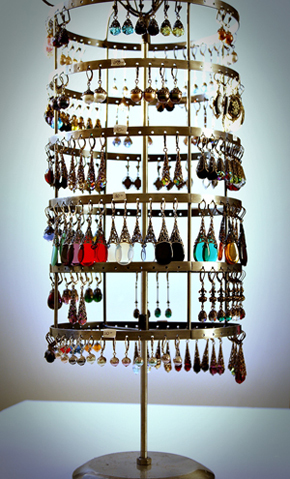 There are many affordable turning earring racks available at display/packaging suppliers as well as directly from China on trade sites such as Aliexpress. Aliexpress is one of my favourite places to look for ideas on how to display jewelry as they also offer a wide variety of affordable items that can be converted into a display. THREE - Think Outside the Box - Look in non display stores for revolving racks such as: home organization stores, kitchen stores and bathroom accessory departments. For example: a free standing multi towel bar can make a nice long necklace display provided you find a stand that does not immediately scream "towel holder." A small revolving shoe holder can also be converted into a pendant display by creating some small fabric covered, padded foam boards that will hold a pendant or even a few pendants per section. The wire frame can also be sprayed any colour you like such as: antique bronze or pewter. Visit The Jewelry Making Website's profile on Pinterest. FOUR - Cake Stands - On the topic of revolving racks, three tier cake and dessert stands can make a super functional and attractive display for jewelry. Below is a photo of a great stand that I saw in a store. Not only was it pretty, but it was nice and heavy making it ideal for an outdoor show and it has these great little lacy slots for attaching earrings. This stand just happened to revolve as well, but even if you do not find one that revolves you can adapt it by attaching a lazy Susan to the bottom. The great thing about thinking outside the box, regarding how to display jewelry, is that you will start to come up with all sorts of ideas on your own once you start to explore. You can make your own three tiered display by stacking round trays and turned wood such as a sofa leg or a candle stick in between the trays and fasten them by using a drill and some hardware. FIVE - Mirrored Vanity Tray - Again being creative about how to display jewelry will lead you to look in non traditional places such as: thrift stores and antique shops. Other places that often carries items that are good for display are Winners and Homesense. 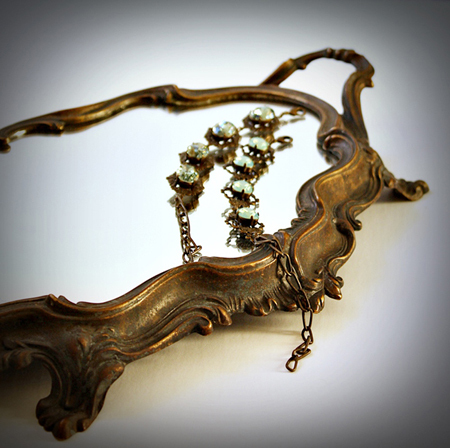 Below is a photo of a great reproduction, vintage vanity tray. 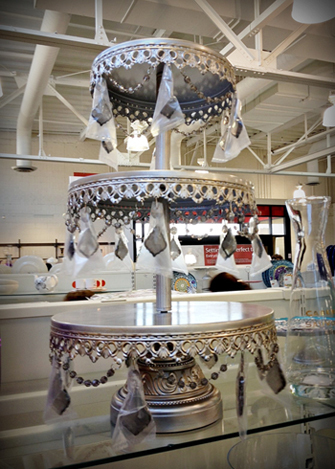 Not only does it look great as a display item, it looks absolutely decadent when layered with Swarovski laden jewelry. The mirrored reflection of the crystals really makes the display look rich. SIX - Art Store Frames - A picture frame is a great starting point for a jewelry tray or a jewelry case. You can either back the frame with a piece of fabric covered, padded cardboard and you have an instant jewelry tray or you can have thick glass cut to fit within the frame to make a case. Do not use the glass that comes with a picture frame as it is far too fragile. Make sure that you choose a glass thickness that is durable enough to be carted around and stacked with the rest of your display. The glass can be secured with some metal wedges in the back of the frame and then sealed in with some silicone. 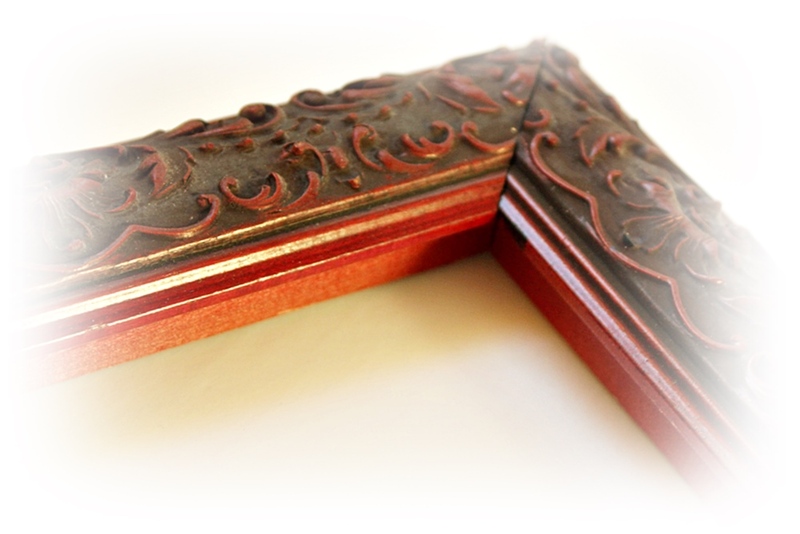 You can purchase some wood lengths at a building store and even have the pieces cut to put together into a box shape. Then all you need is a wood bottom and a piano hinge to attach the framed glass top. You can stain or paint the case to match the frame. SEVEN - Necklace Boards - With a little foam core, some quilt batting and fabric it is easy to create necklace boards. The best thickness for necklace boards is 1/2 an inch, but it can be pricy. What I do is buy the regular 1/4 inch from the dollars store and double them up. It is much cheaper and works great. You can cut the foam into whatever shape you like and cover it with some batting, then wrap the fabric around the back securing it with strong tape or staples. To make the back look nice and clean just use some white glue and attach some Bristol board. Voila! you have a professional looking necklace board. 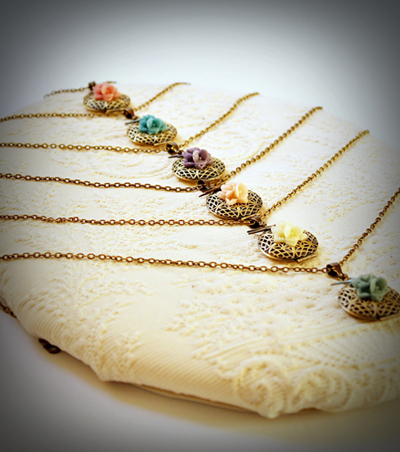 Just use some pearl or ball head sewing pins to attach your necklaces. How to display jewelry in a way that will do your work justice is about testing and creating beauty with optimum function. When choosing colours and fabrics consider how they lend themselves to your work. Charcoal linen would lend itself beautifully to sterling and creamy matelassé looks fabulous with chunky vintage pieces. Just be creative!